I visited a friend of mine the other day, and she wanted to show me some new clothes she had just bought. So we stepped into her walk in closet, and wow! It was the most organized closet I've ever seen in my life. Not one room in my house, in fact, let alone my own closet, is half as organized as hers. She had all like items together, tank tops, short sleeved shirts, long sleeved shirts, and then they were all organized by color and in hues. So, you went from light pinks, to bright pinks, to reds, and so on! When I found this site that offers jewelry trays for your closet from The October Company, I immediately thought of her. From a company press release: Versatile jewelry trays by The October Company – the new Crown Jewel of your closet Versatility has reached new heights with The October Company's new Triple-Tier Jewelry System and Deluxe 32 Compartment Jewelry Tray. These new trays create spectacular storage spaces with built-in flexibility for your custom closet design. 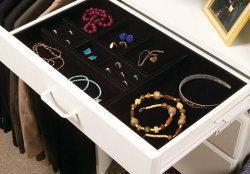 The Triple-Tier system offers many options for storing jewelry and other valuables. It can be configured into one, two or three acrylic tiers with a suspended or sliding upper tray, which provides easy access and ample storage. Choose lower tier acrylic dividers or combine with a plush nylon velvet tray for scratch free storage. Trays are available in clear, black or glass green acrylic. Velvet tray and ring pad are included. If you have the room and aren't a slob like myself, these would be nice to have because it would make it much easier to match jewelry pieces, necklaces, earrings, etc. to your chosen outfit since your clothes would be right next to your jewelry tray. Next month is another chance to visit one of the career fairs held by Gemological Institute of America (GIA). This one is scheduled for October 27th in Carlsbad, California. GIA is a leader in jewelry and gemstone related education, so this is a great opportunity for those looking to get into the jewelry business or switch careers if you are already in it. From Fiber2Fashion.com: On Oct 27, Gemological Institute of America (GIA) will host its West Coast Jewelry Career Fair and Open House from 8:30 a.m. to 3 p.m. at the Institute's headquarters in Carlsbad. Hundreds of GIA students, seasoned professionals, and entry-level job seekers are expected to converge on GIA's Robert Mouawad Campus to meet some of the industry's most prominent employers, including Tiffany & Co, Whitehall Jewelers, Zale Corp, and Movado. These job recruiters come to Career Fair to showcase scores of exciting employment opportunities and conduct preliminary interviews with promising candidates. Job seekers can also jumpstart their careers by meeting the many industry VIPs who volunteer at Career Fair each year to offer advice and insight into what it takes to succeed in this diverse and rewarding field. One-on-one career coaching, professional development seminars, and networking with the trade's key players are some of the benefits available to job seekers who attend this industry-wide job fair. I went shopping the other day for the perfect outfit for a super duper important meeting I'm going to in about a month. I have to do a presentation, but I also have to drive a good distance before doing it, so I was looking for something that was both comfortable and professional. It was nice to learn that due to finally getting a few pounds off I'm almost a size smaller than I thought, but that's the thing, "almost." I'm in between sizes, so finding the right size was pretty much impossible. Retail consumers, when shopping for jewelry, must deal with many of the same issues confronted when shopping for clothing: trends, design, function, and size. If a consumer finds a piece of fine jewelry that fills all of the requisites for purchase, except that it does not fit in size, then most likely they will not purchase the item. JCOC respondents, however, were largely amenable to alternatives to sizing. The JCOC respondents were clearly in favor of adjustable or convertible alternatives for bracelets or necklaces, but were not enamored of adjustable rings. Maybe the latent memories of cheap plastic expandable rings from 25Â¢ gum ball machines are to blame. Diversity, not only in design, but in size and sizing alternatives will attract a larger audience of retail consumers and is an issue prevalent to jewelry designers, manufacturers, wholesalers, and retailers-all facets of the jewelry industry which point to the end-use retail consumer. 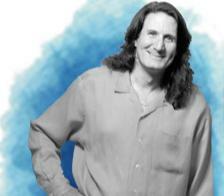 Get ready to put your sun glasses one when viewing the various jewelry collections at the Mark Silverstein web site. This fine jewelry designer primarily works in gold and platinum metals accompanied by diamonds and other wonderful gemstones. He is one of the first to create the engraved platinum look, and as you can tell from his designs, he and platinum are good friends. My first introduction to the crafting world was by way of needle and thread. That is probably the case with most of us I would imagine. Besides needle work like embroidery and cross stitch, I also tried sewing. I had a heck of a time learning to sew until I finally managed to hook up with a wonderful teacher slash friend in college who helped me finally learn the tricks of the trade. Fiber is still a favorite art medium of mine, so I flipped when I saw these woven bracelets, chokers, even dog collars by jewelry designer Carolina Bucci. With a long family history in the jewelry world, Bucci's roots are obviously what guided her into the business, but when you look her various collections on line you'll see that she has made her own voice heard in the jewelry design world. Here are just a few pieces from her woven collection. It was really hard to pick just a few though! I seem to find new jewelry collections for men popping up every day now. Finally! I think this has been a long time in coming, too long really. Granted, your macho man may not be a big fan of jewelry, but I think with the variety of designs we are seeing these days, it won't be too difficult to find something he likes. For example, what about steel, gold, and diamonds from the Stel Collection by L.B. Goodman and Company? Pictured left is a stainless steel, 14kt gold, and diamond bracelet from this collection. The back of the band is similar to a watch band, so it is comfortable as well as fashionable. Here are a few more piece from the collection, rings, bracelets, pendants, all mixing metals, diamonds, and in some cases enamel finishing. I am a big sap when it comes to Victorian inspired anything. While I try to read the occasional contemporary novel, nothing beats sticking my nose in a good old Victorian novel, like something from the Brontes. Maybe that's why I like antique-style jewelry so much. Sybil Shimazu, Jools' head designer, was thinking similar thoughts when she designed their Victorian Bohemian Collection. Victorian Bohemian Collection from Jools [...] was inspired by a fictional Victorian woman drawn into Bohemian life at the turn of the 20th century. A fun and eclectic mix of handcrafted silver, 14-karat gold-fill, semi-precious and precious gemstones, Jools designs are all made by hand in Los Angeles . The pieces are au courant and on point with current trends, with one key difference: the price. "When I designed these pieces, I kept imagining this Victorian woman discovering Paris in the late 1900s, drinking absinthe with poets and letting her hair down," says Sybil Shimazu, Jools' head designer. "The Jools Victorian Bohemian collection showcases designs that I visualized her wearing-delicate, lacy filigrees in dramatic black, accented with onyx and smoky quartz." It's unanimous that long beaded necklaces and slightly "over-the-top" necklaces are definitely IN! The trend also continues for chunky beads and chain-link designs. There's a good showing of silver and gold, too…to match those gaudy handbags and big belts. Long necklaces, also called "ropes" are so fun and versatile to own and wear. They are also really exciting for me to design. You can wear them super long as a single strand, or wear them doubled or tripled for different looks with various outfits! 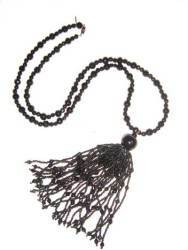 I can say that Kenneth already has a number of longer looks on his web site, like this 31 inch black vintage Czech glass beaded necklace (above). And here are few other long lovlies. After adding loads of new blog URLs to my blog roll last week, I'm very excited to show off some of the great content from my latest blog buddies. 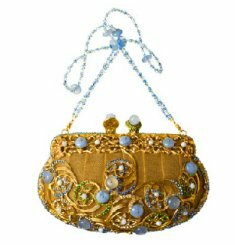 First, starting with The Bag Snob, she picks out some wonderful jeweled hang bags (one pictured here), adorned with crystals and gemstones, from Wendy Lau. Beauty Addict describes a new look in make-up using eye-liner and smudging it. Aesthetics + Economics is surprised by seeing lots of zippers coming down the runways. The Beauty Newsletter turns us onto free make-up samples! Thank you! Blogdorf Goodman offers up some lip gloss and other dishy bits. eBeauty Daily reports on the latest scents from Sharon Bolton. FashionTribes has found some "nerd chick" cuff bracelets – too funny! GirlaWhirl covers Fashion week in London for us. Nail Tech Secrets has the latest about colors for fall from Essie. Style Bites gives a report of accessories trends for 2007. Trashionista realizes fall is here, so time for the first sweater pick of the season, which is accented with some cute buttons to boot. Second City Style gives us the 4Bs – belts, bags, boots, and baubles. Jewelry and Beading thinks about making fashion versus following fashion trends. Any sort of jewelry connected to memory is very popular right now. The whole "memory" theme is popular also in other areas such as literature and art in general right now, in fact. charm bracelets are a great way to make your own memory-story as each charm you select for your bracelet has a special meaning for the wearer. I was cruising around looking for charm bracelets and discovered Rembrandt Charms. They sell charms and bracelets, but what is extra fun is that they have a virtual charm bracelet design function on their site. It took a little getting used to, but I finally managed to come up with what you see here. My Word Press software sized it down a little, but I think you get the idea. You get to select the type of chain you want, silver, gold-plated, size of links, etc., along with specific charms from their web site. You click and drag them to your bracelet, and as you do so, they calculate the final cost.